The "eighth principality of Cardolan" is an ironic curiosity, steeped in nobility, but saturated in corruption; nominally ruled by the Cardolani king (861-1409) or Gondorian Canotar (1414-2052), but effectively a free city; a riverport that survived almost to the end of the Third Age (2912), long after the rest of Cardolan ceased to exist (c. 1700). 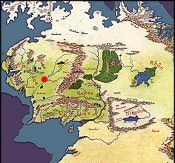 It's the closest thing to Lankhmar that exists in Tolkien's world: a decadent overcrowded melting pot so unlike the grand cities like Annuminas, Minas Anor, and Minas Ithil we associate with Middle-Earth -- a point to which we will return shortly. I almost think Tharbad should have been done as a city module, and it probably would have been if the city series had existed at the time. It's fittingly set in the year 1410, during the chaotic aftermath of the Second Northern War, offering scenarios of extortion rings, food smugglers, and all levels of sordid thievery. The two-page color coded map of Tharbad is essentially the entire module, with certain buildings and sites laid out in more detail. The Gwathlo River divides the city into three parts: the north and south banks, and the island bridging them. The north side is dominated by guilds like the glassblowers, lampmakers, masons, gravediggers, and singers, while the south boasts more educated talents such as guides, scholars, healers, alchemists, and shipwrights. The center island, meanwhile, is the heart of the city, with dockyards on the far west (the oldest part of the city founded by Tar-Aldarion in the Second Age), and the merchant's quarter and its moneylenders adjacent to it. The east side is the high point, and assaults with contrasts: King's Row closest to the center, including the mayor's office and townhouses of the seven hirs (princes) of Cardolan, as well as luxury shops and homes of the richest merchants; this area segues into the commoner's quarter where the city is actually run by servants and artisans; finally, at the far eastern end is Middle-Earth's version of Lankhmar, the poorest quarter of the entire city, a decaying labyrinth of streets swarming with thieves, whores, and drug-dealers. 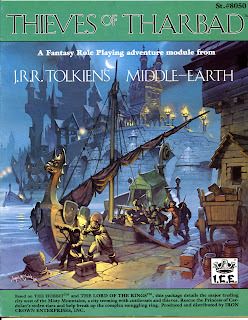 This last in particular, and the corruption of Tharbad in general, forces interesting questions about the supposed incompatibility of Tolkien's "pure" high-brow fantasy with the gritty pulp universe of classic D&D. 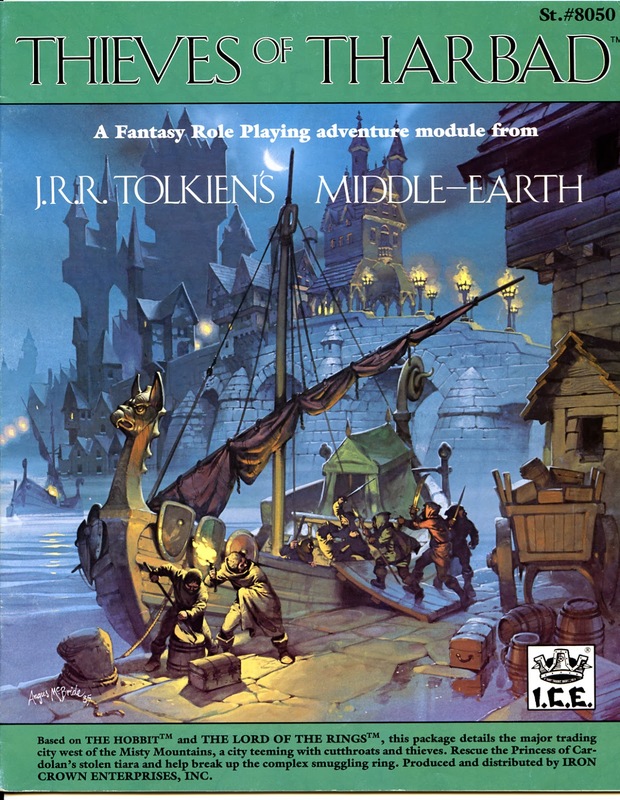 Now, as a DM I certainly never imposed these mechanisms on players in Middle-Earth, nor were they imposed on me, but the message is loud and clear: wizards like Gandalf don't go around fireballing and shapechanging as they please; magic in Endor is precious and subtle, and even a threat to one's soul. What does this have to do with Thieves of Tharbad? Simple. More than any other ICE module, it reminds me of classic D&D adventuring where spell casters do snap away with abandon, and where characters in general are hardly subjected to an omnipresent moral ontology (unless for some bizarre reason they worship a deity who micro-manages their every move). The most compelling alignment in D&D is the chaotic neutral one, which our heroes in the Fellowship of the Ring would find anathema. The amoral leaning, in other words, of barbarians like Fafhrd and thieves like Mouser. They would have been right at home in Tharbad. Next up: Hillmen of the Trollshaws. Interesting observations and summary. Thank you.